Hooray for good old fashioned fun! If you followed my facebook posts over spring break, you saw that we had a somewhat eventful week. My kids got hurt. My kids got hurt – A LOT. When I look back at it, I find it a tad humorous. I wonder how we all survived our childhood. Just think of our parents or grandparents generation before there was all the safety nets we have in place now. Before our break even started, I made a conscious decision that the kids were not going to sit in front of the TV, the X box, the Wii, Nintendo DS’s, or any other electronic entertainment all week long. I am tired of the constant programming! At first it was pretty easy because my kids were grounded from all such entertainment because of the rooms and lack of willingness to finish the job. As the rooms got finished, the requests started. At first, they were horrified at every reply of “no.” At first, they had absolutely no idea of what they were going to do. At first, they stared at me in hopes of my mind magically changing. Then, the most amazing thing happened. They played. My kids are pretty good about playing like kids. We have always encouraged them to just be kids, but lately it seemed that they were forgetting those lessons. Before I knew it, I was heard the sounds of “Ghost Runners” on first and second base as the back yard became occupied with a baseball game. The game was joined by neighbor kids. I even got to referee, and they let the old lady bat a couple times. Sure, my two youngest found great pleasure in “Doggy Digging” in the dirt up from under the pine trees, and they left rings around the tub several evening. But, they were out playing in the dirt, and dirt washes. They played with sticks. (and the probably ran with them) They played with rocks. They shot BB Guns, and they shot their bow and arrows. They made forts, and they played Capture the Flag. They road bikes, scooters, and roller skates. Yes, they sprained a wrist, nearly broke a nose, and had a forehead abuse a corner in the hallway, but they had fun. They were KIDS! Not programmed. Not plugged in. Just kids. Like we used to be. Posted on April 23, 2012 Leave a comment on Hooray for good old fashioned fun! Listen up you little punk – and I mean me. I have been honest about my struggles as of late, and I don’t write about it to get sympathy or praise of any kind. I write because I love to, and it helps me so much to put it “out there.” I have been so encouraged by friends old and young who have sent me little notes. It has brought this topic back to my mind. I have written before about mentoring. I feel that mentoring is something we Christian women in particular are not too great at. If you read Titus 2, you can not deny that although “mentoring” is a new word, it is an old concept. It is Biblical. But as for you, teach what accords with sound doctrine. Older men are to be sober-minded, dignified, self-controlled, sound in faith, in love, and in steadfastness. Older women likewise are to be reverent in behavior, not slanderers or slaves to much wine. They are to teach what is good, and so train the young women to love their husbands and children, to be self-controlled, pure, working at home, kind, and submissive to their own husbands, that the word of God may not be reviled. Likewise, urge the younger men to be self-controlled. Show yourself in all respects to be a model of good works, and in your teaching show integrity, dignity, and sound speech that cannot be condemned, so that an opponent may be put to shame, having nothing evil to say about us. Bondservants are to be submissive to their own masters in everything; they are to be well-pleasing, not argumentative, not pilfering, but showing all good faith, so that in everything they may adorn the doctrine of God our Savior. Paul specifically takes time to address women separately about being teachers to younger women. The younger woman can see here a list of specific things we should be DOING! The problem I see in the current time is so often younger women don’t want to listen. We feel like we have it together, and we don’t have much to learn. We think that we are much more educated that our older counterparts. Our society has ingrained this into our mind since the rise of women’s lib. I am not saying nothing good came out of the women’s lib movement, but I do know that a lot of harm is also being done to our God given role as a woman in the home. Another issue falls with the older women. I think the older woman often sees the younger as know-it-all little punks, who don’t deserve the wisdom that can be offered or won’t listen anyway. Also, being prepared to mentor younger women requires the older women to stay in the Word and in constant communication with the Lord. It is a lot of hard work! I find myself in the odd place of needing mentoring and needing to mentor. I am 35 and stuck in the middle. I definitely not young, and definitely not old. Yet, I am a pastor’s wife and a mother and a teacher, and I am placed in a role of example to many. I am so inadequate for the job. I wonder what God is thinking sometimes! Who am I that he could use me and my miserable little self to reach other women? I fail, and I fall. I struggle, and I fall. I get so discouraged. I put my focus in the wrong place. Then, I am so encouraged by those who God has put in my life. I have wonderful friends who constantly lift me up, and every so often God gives me a wonderful tidbit from places I don’t expect. In the last two days, I have been so encouraged by three women in particular. They might cringe, but they are “Older” women in the faith. They have raised ( or nearly raised) their children. They have stood strong in their faith, and God has blessed them. God gave me my GFN a few years ago, because He knew I needed her. She continually encourages me, and I can always count on her for wise counsel and a good laugh. What a perfect combination! She was there to encourage me. I also got two notes from other women. Women that I have known nearly my whole life, and have seen me from childhood to womanhood. Two women that I rarely see, and two women who listened to His prompting. Two women encouraged me to stick by the stuff. Two women encouraging me to keep my focus on Him, and rely on His strength. Isn’t that what we are called to do? Isn’t that what we are to do for our Christian brothers and sisters? Isn’t that mentoring? I am so thankful for God leading in their hearts and in mine. I am so thankful for the encouragement straight from Him. Posted on April 11, 2012 2 Comments on Listen up you little punk – and I mean me. Last month, we celebrated little girl’s 1oth birthday and Little Grandpa’s 94th. I am finally getting around to posting the pictures! I don’t know if little girl loves the fact that we celebrate their birthday’s together, but I hope she will look back at it fondly. I know little Grandpa doesn’t have too many more birthdays in him. I love that our kids know him and love him. I love that the generations mix and enjoy each other. I think in our society that we do not value our family enough and we definitely don’t value our older generation. They are full of so much knowledge and wisdom. I want my kids to value that. I can’t believe that little girl is ten. She seems to grown up these days. As I wrote earlier, I am truly struggling mentally. I am battling feelings of self doubt and disappointment and frustration with others. The frustration with others only magnifies when I feel like they are pinpointing the same things that I am irritated with in my own mind. I know that MY heart isn’t in the right place when I am frustrated with those negative around me. I want to kick and scream and occasionally stab someone in the eye with a fork. I want to tell them that I am a pretty decent person just trying to do the right thing. I want them to appreciate me… at least a little. However, I KNOW that this isn’t where my heart should be. I KNOW that I am not doing any of this in my own strength, and it is truly God’s grace that pulls me through each day! I KNOW that each time I put my focus on poor me, I am pulling my focus off HIM. No wonder I am sinking some days! I might as well change my name to Peter! My focus shifts and I sink. Lord, please remind me to keep my focus on You. Posted on April 11, 2012 1 Comment on The water is rising..
We are the midst of a pantry and linen closet remodel. As a result, I am going to get to finally paint the big bathroom. It has needed it for a while, and now with new drywall surfaces, I am going to get it done. The question is What am I going to do in there? It is a large space and can stand a big color, which I am inclined to because so many of the rooms in the house are very mellow colors. I thought about that great tealish aqua color that is popular or orange or green or…. anything really. Here is a little view of the bathroom. This is also the kids bathroom. I would like it to be lively and fun. Whimisical without being annoying. I don’t want fish or swinging monkeys or anything dumb. I have been looking at shower curtains because I think that you can swing a whole color scheme on that focal point. I like this, but wonder if it is too cheezy. 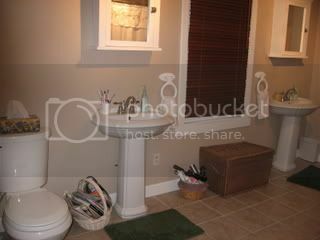 Additionally, the bathroom is already tan with brown and green accents. I would like to see a change. I could paint it the green in the curtain… but my master bath is that color too. I like this, and I could definitely see the bathroom the aqua/teal color in this. so… thoughts? Ideas? I am really open to anything great. This is just from one site, and by no means exhaustive.